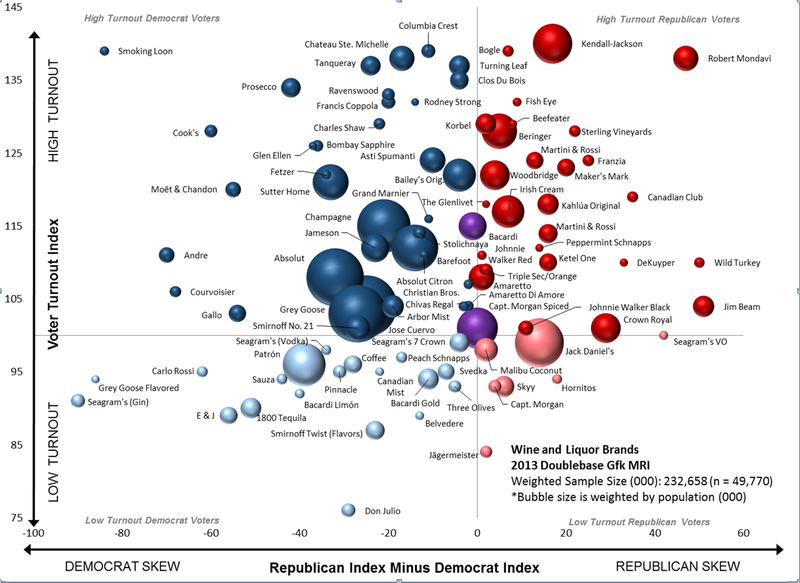 The chart above, produced by the right-leaning research firm NMRPP and first published in the Washington Post last week, shows the comparative political inclinations (and relative voter turnouts) associated with the drinkers of various major liquor brands. At first glance this may look like it conforms to some basic stereotypes about the two parties—Democrats like wine! Republicans like whiskey!—but wine actually runs the whole political scale, with Smoking Loon drunk primarily by Democrats, and Robert Mondavi drunk primarily by Republicans. Major whiskey brands do generally show a Republican bent, with the exception of Jameson, Canadian Mist, and Glen Ellen. Gin is nearly exclusively Democratic, but the real lesson of the chart is to stay away from Jägermeister, a bi-partisan scourge that apparently renders you unable to get up and vote.